In the heart of Austin is the Ann and Roy Butler Hike-and-Bike Trail at Lady Bird Lake, a lush, urban path that meanders along the water’s edge and passes by skyscrapers, neighborhoods, ball fields and cultural attractions. With the completion of the Boardwalk portion of the Trail in June 2014, the 1.3 mile gap along the south shore has been closed, and the Trail now serves our city in an additional way – as an alternative transportation route for our growing urban core. With more than 2.6 million visits a year, the 10-mile trail is Austin’s most recognized and popular recreational area. The Ann and Roy Butler Hike-and-Bike Trail, named for a former Austin mayor and his wife, is a natural gem in the heart of the Texas capital. But the Ann and Roy Butler Hike-and-Bike Trail is more than a great pathway—it is a place where Austin thrives. For many citizens and visitors, it represents the best Austin has to offer: outdoor recreation; a scenic, natural environment; and a diverse, vibrant mix of people. In 2008, the Austin City Council appropriated funds for preliminary design, engineering, and public involvement for the Boardwalk at Lady Bird Lake. In 2010 and 2012, Austin voters approved additional bond funding, accompanied with a generous list of donors coordinated by the Trail Foundation. Construction started in October 2012 and was completed in early June 2014. The $28 million project features over 300 piers, 2,200 pre-cast concrete deck planks, 13,000 LED lights, 1.3 million pounds of structural steel, 7 viewing areas, ADA accessible pier, and a new trailhead restroom along the 7,250 feet boardwalk. Art in Public Places, a program of the Cultural Arts Division of the Economic Development Department, commissioned artist Ken Little to create artwork for the Boardwalk at Lady Bird Lake. Belting It Out is an installation of 36 cast bronze, western-style belts integrated into the railings on both sides of the Boardwalk. Song lyrics from well-known Texas singers and songwriters are embossed on each belt. Hours: The Boardwalk is open from 5am to midnight each day, with a curfew between midnight and 5am. 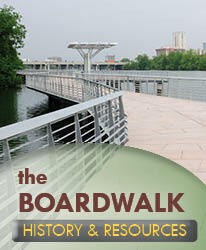 Boardwalk Access: The Boardwalk can be accessed at several points – the northeast corner of the American-Statesman parking lot, off the Riverside Drive sidewalk at Blunn Creek, from the northeast corner of the Riverside and IH35 intersection and at International Shores Park, 1820 S. Lakeshore Blvd. Parking: Street parking is available along S. Lakeshore Blvd. between Pleasant Valley Road and Riverside. Or if you are walking the Ann and Roy Butler Hike-and-Bike Trail loop, you can park at Festival Beach across the river, or at any of the parking areas near the trail. Fishing: is allowed on the rest areas but not along the main trail. Maintenance: To report trail maintenance issues, please call 311. View the map of the Boardwalk Trail Project!